The Secretary of the Navy (or SECNAV) is a statutory officer (10 U.S.C. § 5013) and the head (chief executive officer) of the Department of the Navy, a military department (component organization) within the Department of Defense of the United States of America. The Secretary of the Navy must be a civilian by law, at least 5 years removed from active military service. The Secretary is appointed by the President and requires confirmation by a majority vote of the Senate. The Secretary of the Navy was, from its creation in 1798, a member of the President's Cabinet until 1949, when the Secretary of the Navy (and the Secretaries of the Army and Air Force) was by amendments to the National Security Act of 1947 made subordinate to the Secretary of Defense. The Department of the Navy (DoN) consists of two Uniformed Services: the United States Navy and the United States Marine Corps. The Secretary of the Navy is responsible for, and has statutory authority (10 U.S.C. § 5013) to "conduct all the affairs of the Department of the Navy", i.e. as its chief executive officer, subject to the limits of the law, and the directions of the President and the Secretary of Defense. In effect, all authority within the Navy and Marine Corps, unless specifically exempted by law, is derivative of the authority vested in the Secretary of the Navy. Specifically enumerated responsibilities of the SECNAV in the before-mentioned section are: recruiting, organizing, supplying, equipping, training, mobilizing, and demobilizing. The Secretary also oversees the construction, outfitting, and repair of naval ships, equipment, and facilities. SECNAV is responsible for the formulation and implementation of policies and programs that are consistent with the national security policies and objectives established by the President or the Secretary of Defense. The Secretary of the Navy is a member of the Defense Acquisition Board (DAB), chaired by the Under Secretary of Defense for Acquisition, Technology and Logistics. Furthermore, the Secretary has several statutory responsibilities under the Uniform Code of Military Justice (UCMJ) with respect to the administration of the military justice system for the Navy & the Marine Corps, including the authority to convene general courts-martial and to commute sentences. The principal military advisers to the SECNAV are the two service chiefs of the naval services: for matters regarding the Navy the Chief of Naval Operations (CNO), and for matters regarding the Marine Corps the Commandant of the Marine Corps (CMC). The CNO and the Commandant act as the principal executive agents of the SECNAV within their respective services to implement the orders of the Secretary. The United States Navy Regulations is the principal regulatory document of the Department of the Navy, and any changes to it can only be approved by the Secretary of the Navy. Whenever the United States Coast Guard operates as a service within the Department of the Navy, the Secretary of the Navy has the same powers and duties with respect to the Coast Guard as the Secretary of Homeland Security when the Coast Guard is not operating as a service in the Department of the Navy. The Office of the Secretary of the Navy, also known within DoD as the Navy Secretariat or simply just as the Secretariat in a DoN setting, is the immediate headquarters staff that supports the Secretary in discharging his duties. The principal officials of the Secretariat include the Under Secretary of the Navy (the Secretary's principal civilian deputy), the Assistant Secretaries of the Navy (ASN), the General Counsel of the Department of the Navy, the Judge Advocate General of the Navy (JAG), the Naval Inspector General (NIG), the Chief of Legislative Affairs, and the Chief of Naval Research. The Office of the Secretary of the Navy has sole responsibility within the Department of the Navy for acquisition, auditing, financial and information management, legislative affairs, public affairs, research, and development. The Chief of Naval Operations and the Commandant of the Marine Corps have their own separate staffs, the Office of the Chief of Naval Operations (also known by its acronym OPNAV) and Headquarters Marine Corps. John Langdon 13 October 1775–? Silas Deane 13 October 1775–? ^ "Guide to Federal Records – General Records of the Department of the Navy, 1798–1947". Retrieved 23 September 2007. ^ "The US Navy". Retrieved 23 September 2007. ^ "US CODE: Title 10,5013. Secretary of the Navy". Retrieved 23 September 2007. ^ "U.S. Navy Biographies – The Honorable Donald C. Winter". Retrieved 23 September 2007. ^ "US CODE: Title 10,5013a. Secretary of the Navy: powers with respect to Coast Guard". Retrieved 23 September 2007. ^ "US CODE: Title 10,5014. Office of the Secretary of the Navy". Retrieved 23 September 2007. ^ "Department of the Navy, Office of the General Counsel (DON-OGC) – OGC History". Archived from the original on 24 July 2007. Retrieved 23 September 2007. ^ Cahoon, Ben (2000). "United States Government". World Statesmen. Retrieved 14 April 2009. ^ Joseph Hewes. Dictionary of American Naval Fighting Ships. Naval Historical and Heritage Command. ^ a b c d Staff reporter (29 December 2005). "Acting Deputy Defense Secretary Relinquishes Top Navy Post". American Forces Press Service. Retrieved 18 May 2009. Navy Undersecretary Dionel M. Aviles will serve as acting Navy secretary effective today. Donald Winter, who was confirmed by the Senate last month, will be sworn in as the 74th secretary of the Navy on Jan. 3. ^ a b c "Navy Secretary Departs Office" (Press release). United States Department of Defense. 13 March 2009. Retrieved 18 May 2009. The 74th Secretary of the Navy, Donald C. Winter, resigned his office today as planned. Winter had agreed to remain in office until March 13, 2009, to ease the transition of the Department of Defense. [...] BJ Penn will be the acting Secretary of the Navy until the Senate confirms a nominee chosen by President Barack Obama. 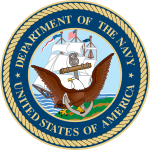 Wikimedia Commons has media related to United States Secretaries of the Navy.